And let us not be weary in well doing: for in due season we shall reap, if we faint not” Galatians 6:9. Some time ago, I shared with you the accident with Turkian. Her right eye is complete without vision. After many times going to the hospital, having all kind of check ups, the doctors found out that the left eye is a so-called “lazy eye” and they can’t help her for now. I have hope that after some time, there will be a way, for her to recover the vision with the left eye. Please keep praying for this young lady. There are these times in life, where all bad things possible, happen to people. Turkian, Ismai,l and there three children live in two rooms. 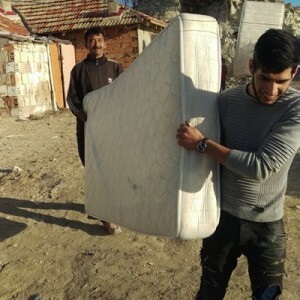 They are poor, but usually have the basic things they need. During the last week of December 2017, there was a fire in their home. They have no wood, and during the bitter cold weather we had here, they were burning old tires, which Ismails finds during the day. It seems that one of the tires exploded somehow and caused the fire. Turkian is blind and until she called for help, the fire burned part of the roof and almost all the luggage and clothes. Praise the Lord nobody was injured. Ismail is not going for tires anymore instead he goes to the nearby forest to get some branches for the stove. 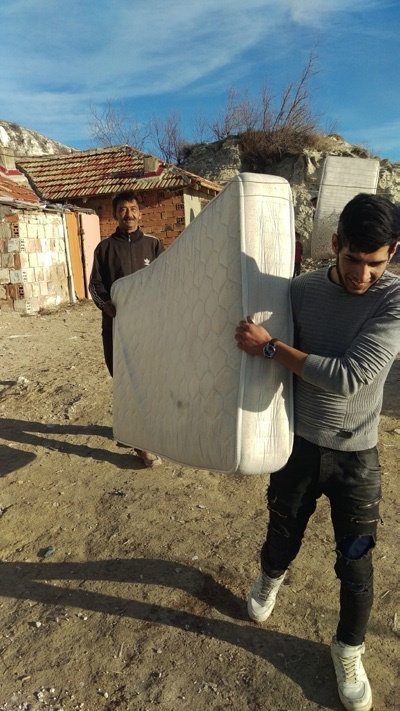 The Free Will Baptist Church in Balchik, helped this family with some good matresses, some food, and some clothes, and will provide them with other things to help them recover from this tragedy. Please keep this family in your prayers. May the Lord bless you and keep you in His love and care, for we know that without your spiritual and financial support we cannot serve the Lord the way we do in Bulgaria. Your faithful support throughout the year, through the Telethon, and special projects makes it possible for us to be able to help people like this in time of great need.